Yum! This reminds me of a drink we make using bubbly and leftover liquid from brandied pears — warm spices, simple syrup, and brandy, all mixed with the exuded plum juices. The cardamom is subtle. It’s there, but not up front. It’s really up to you where you place it, but I wouldn’t call it a spicy drink. This reminds me of a champagne drink I’ve grown fond of lately at a local bistro. 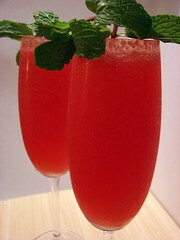 They add a simple syrup of red basil to champagne and produce a result that’s amazingly lovely. Since I’m particularly fond of gin I’m looking forward to trying your recipe. Sounds like the perfect addition to a Sunday brunch. Anita – you’re welcome! Thanks for hosting and passing along some great ideas for fizzy drinks – cheers!